What to pack for safari? As you prepare for your African safari, it is important to pack the right stuff. With years of experience in African safaris, we know what works and what doesn't. You don't want to take too much, but you also want to ensure you're packing the necessary items you'll need while on your vacation. Use this handy packing list to PACK LIKE A PRO! We include examples of what works on an African holiday, for both men and women. And best of all, you can buy most of the items on the list from the comfort of your home! 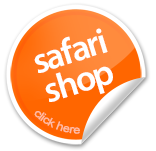 Find travel gear and clothing for your holiday in our online Safari Store.